The concept is several centuries old, but it became a staple of the retail industry during the late nineteenth century. It allows people to become consumers without leaving their homes, and helps businesses achieve sales even when the consumer does not come to the store. Originally intended for consumers who lived in more remote areas, mail-order businesses have become increasingly popular with those living in urban environments. This reflects social change, particularly the increased number of women working outside the home with less time to shop. The convenience of the mail-order system, both in terms of ease of ordering and efficiency in delivery systems, makes it attractive to people with busy, stressful lives. Although the increase in convenience through the use of such technologies appears to make for a higher quality of life, the social interaction that was formerly experienced by shopping at local stores is lost. Trading the social interactions, that are essential to human existence, for external convenience may prove to be more detrimental than beneficial in the long run. Mail-order is a term which describes the buying of goods or services by mail delivery. The buyer places an order for the desired products with the merchant through some remote method such as through a telephone call or a mail-in form. Then, the products are delivered to the customer. The products are typically delivered directly to an address supplied by the customer, such as a home address, but occasionally the orders are delivered to a nearby retail location for the customer to pick up. Some merchants also allow the goods to be shipped directly to a third party consumer, which is an effective way to send a gift to an out-of-town recipient. Mail-order businesses often put out catalogs called mail-order catalogs which are publications containing a list of general merchandise from the company. Companies who publish and operate mail-order catalogs are referred to as catalogers within the industry. Catalogers buy or manufacture goods, and then market those goods to prospects (prospective customers). Catalogers "rent" names from list brokers or cooperative databases. The catalog itself is published in a similar fashion as any magazine publication and distributed through a variety of means, usually via a postal service. Sometimes supermarket products do mail-order promotions where people can send in the UPC code plus shipping and handling to receive a product made especially for the company. Mail-order businesses have gradually shifted from the traditional mail use to telephone orders, citing lower long-distance rates and the popularity of cellular phones. It is also more convenient for the consumer to place an order over the phone rather than mailing in order forms, it cuts off several days from the wait for the product. More recently, mail-order companies have instituted internet ordering options for customers. Mail-order businesses have grown to international proportions; most countries have companies that publish catalogs either through the internet or through magazines. The success of this form of marketing and the ease of creating a mail-order catalog has allowed several independent and small businesses to create their own mail-order companies, expanding their consumer base beyond the community they are founded in. 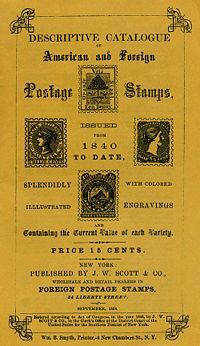 1868 Cover of a Scott catalog for postage stamps. Mail-order businesses are evidenced throughout American history. According to the National Mail-Order Association, Benjamin Franklin is believed to have been the first cataloger in the United States. In 1744, he formulated the basic mail-order concept when he produced the first catalog, which sold scientific and academic books. Early catalogs also allowed farmers to order seeds through the mail. Several of America's modern-day retailers established themselves as mail-order enterprises in the nineteenth century. The earliest surviving mail-order business, now known as Hammacher Schlemmer, was established by Alfred Hammacher in New York City in 1848. Offering mechanic's tools and builder's hardware, its first catalog was published in 1881. Now known for offering an eclectic, premium assortment of "The Best, The Only, and The Unexpected," it is America's longest running catalog. The first mail-order catalog was produced in 1872 by Aaron Montgomery Ward for his Montgomery Ward business. This first catalog was a single sheet of paper with a price list, eight by twelve inches, showing the merchandise for sale and ordering instructions. Montgomery Ward identified a market of merchant-wary farmers in the Midwest. Within two decades, his single-page list of products grew into a 540 page illustrated book selling over twenty thousand items. Another early mail-order catalog was published in 1884 by the Eaton's department store in Toronto, Canada. In the United Kingdom, Pryce Pryce-Jones of Newtown, Montgomeryshire, Wales was also one of the pioneers in the mail order business. He was apprenticed to a local draper, John Davies, and took over Davies' business in 1856. Renamed the Royal Welsh Warehouse, the business flourished. Newtown had always had a woolen industry and it was the local Welsh flannel which formed the mainstay of Pryce-Jones' business. The further expansion of the railways in the years that followed allowed Pryce Jones to take orders from further afield and his business grew rapidly. He launched one of the first mail-order catalogs around the same time as Montgomery Ward. He built up an impressive list of customers—among them Florence Nightingale as well as Queen Victoria, the Princess of Wales and royal households across Europe. He also began selling Welsh flannel from Newtown to America and even Australia. By 1880, he had more than one hundred thousand customers and his success was acknowledged by Queen Victoria in 1887 with a knighthood, when he became Sir Pryce Pryce-Jones. By the latter half of the twentieth century, several socioeconomic factors had further contributed to the growth of "at-home shopping." Possibly the single most important factor was the dramatic increase in the number of women working outside the home. This change gave some families more discretionary income, but perhaps more tellingly, the trend also meant that women had less time to make purchases. Shopping convenience subsequently became a larger concern, and mail-order purchases that could be executed at home—without driving to a mall or other retail outlet—became more attractive. The emergence of credit cards and telephone-based ordering systems also helped mail-order businesses. Gaining popularity throughout the world, mail-order catalogs developed from small, black and white, non-illustrated leaflets into hundreds of pages of colorful pictures and seasonal volumes. 1884 saw the release of the first Canadian mail-order catalog. Timothy Eaton released a small, 32 page catalog to visitors at the Canadian National Exhibition in Toronto. The following year, a flyer announced Timothy Eaton's new mail-order department. Within a decade, Eaton had cornered the mail-order market in Canada, sending out close to one hundred and forty thousand products by post and seventy thousand products express. Eaton made his customers incentives for providing the addresses of their neighbors. He would offer gifts if a customer sent in the locations of other interested households that did not yet receive his catalog. Following the success of the catalog, P.T. Legare opened their own catalog for distribution in 1910, and Goodwin's followed in 1911. Items in mail-order catalogs started out mainly as women and children's clothing. By the 1890s, furniture and farm equipment was available for purchase, and by the early twentieth century, property and materials to build houses could be bought through the catalog. Today, mail-order is still popular in Canada, but the players are different. Eaton's last catalog was published in 1976 and Simpson's, another major Canadian mail-order business, sold its business to Sears. The mail-order system in the United Kingdom flourished shortly after its initiation into the United States consumer habits during the later nineteenth century. In addition to Pryce-Jones' Royal Welsh Warehouse, Littlewoods was a major player. The industry developed as strong social factors were influencing the populace: the rise of feminism, the gender composition of the work world, and an increase employment and literacy. Post Office reforms and the arrival of more railways benefited many customers. Pryce-Jones hit upon a unique method of selling his wares. People would choose what they wanted from leaflets he sent out and the goods would then by dispatched by post and train. It was an ideal way of meeting the needs of customers in isolated rural locations who were either too busy or unable to get into Newtown to shop. It was one of the world's first mail order businesses and it was a pioneering method set to change the nature of retailing throughout the world. Littlewoods was started by John Moores in 1932. He had already been a successful businessman, and looked to the Sears-Roebuck model of mail-order business to expand his own consumer base. Littlewoods created its catalog with the every day family in mind. Early twentieth-century families in the United Kingdom were, in many instances, extremely poor. Littlewoods sought to create a catalog that was affordable and did not put families in any more debt, as was custom for many families at the time. The first Littlewoods catalog was published in 1932 and was one hundred and sixty-eight pages. The catalog also sponsored free gifts to its readers in order to increase its consumer base: free gifts were given to random readers at different locations. Littlwoods flourished and soon opened up a series of chain stores in 1935 throughout the country to add on to its mail-order business. An ad for an Acme anvil, from the 1902 Sears Roebuck catalog. Aside from the launch of the Montogmery Ward catalog, another pioneering company in the field was the Chicago-based R. W. Sears firm that launched its services in 1891, soon joining with Roebuck to form Sears Roebuck & Co. The fact that both Sears Roebuck and Montgomery Ward were based in Chicago was significant as the city was at the hub of the extensive American railway system, enabling the transfer of goods from sources of production to rural communities throughout the United States. In parallel, the American postal system, which had undergone extensive modernization before the First World War, enabled orders to be placed easily and efficiently. Mail-order catalogs were often known as "wish books," providing insights into American life at different periods. Such publications also provided immigrant settlers with a means of viewing the "American way of life." 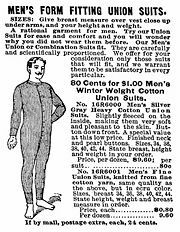 Advertising image of a union suit from the 1902 Sears, Roebuck catalog. Richard Sears knew that farmers often brought their crops to town, where they could be sold and shipped. Before the Sears catalog, farmers typically bought supplies (often at very high prices) from local general stores. Sears took advantage of this by publishing his catalog with clearly stated prices, so that consumers could know what he was selling and at what price and order and obtain them conveniently. The catalog business soon grew quickly. By 1894, the Sears catalog had grown to three hundred and 322 pages, featuring sewing machines, bicycles, sporting goods, and a host of other new items. Sears, Roebuck and Company soon developed a reputation for both quality products and customer satisfaction. By 1895, the company was producing a 532 page catalog with the largest variety of items that anybody back then could have thought of. In 1893, the sales topped four hundred thousand dollars, and 1895 saw an increase to seven hundred and fifty thousand dollars. Mail-order businesses contribute to two different social spectra. On the one hand, it is one of the earliest components of globalization. A person was able to pick out a product and have it sent anywhere in their country, and later, internationally. This means that products that may be difficult or unavailable in one community are easily attainable through a mail-in order form. On the other hand, it presents a loss of contact. Some sociologists have suggested that living in closer proximities to each other, such as in urban settings, causes people to isolate themselves further and withdraw from daily human contact. No longer do people have to go to the store for products, through mail-order businesses they can send in an order form, make a telephone call, or use the internet to send out their request. This contributes to the decrease of human interactions, resulting in people putting a higher value on money than personal human relationships. JC Penney, a department store in the United States. The Noble Collection, a business which only operates through mail-order and the internet. Spiegel, is a leading catalog marketing company in the United States. Welco, one of the oldest catalog companies in the United Kingdom. Prezzybox, an online catalog in the United Kingdom. ↑ 1.0 1.1 Erwin Keup, Mail-Order Legal Guide (Oasis, 1993, ISBN 978-1555711900). ↑ 2.0 2.1 Maxwell Sroge, Inside the Leading Mail-Order Houses (NTC Business Books, 1987, ISBN 0844236594). ↑ 3.0 3.1 3.2 Jonathan Woodham, A Dictionary of Modern Design (Oxford University Press, 2004, ISBN 0192800973). ↑ 4.0 4.1 Staff Writer, 2007, Canadian Mail-Order Catalogues - History Library and Archives Canada. Retrieved March 4, 2008. ↑ Richard Coopey, Mail Order Retailing in Britain: A Business and Social History (Oxford University Press, ISBN 978-0198296508). ↑ 6.0 6.1 Littlewoods, 2006, Littlewoods Catalogue Home Shopping: Seven Decades of Mail Order Shopping in Britian Retrieved March 4, 2008. ↑ Georg Simmel, The Philosophy of Money (Routledge, 2004, ISBN 978-0415341738). This page was last modified on 7 August 2018, at 18:58.